Charles A. “Chuck” Donovan | February 7, 2017. 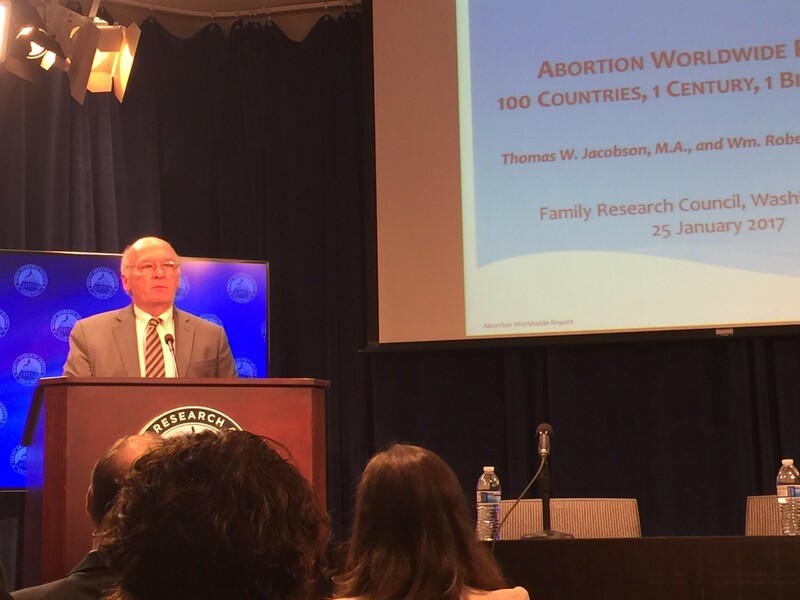 On January 25, Charlotte Lozier Institute President Chuck Donovan presented opening remarks* at the Family Research Council during an event launching the major report entitled, “Abortion Worldwide Report: 100 Countries, 1 Century, 1 Billion Babies.” The report, authored by William Robert Johnston, Ph.D., and Thomas W. Jacobson, M.A., is the first to systematically track reported abortions in 100 nations, territories, and regions, from the year of authorization through 2015. The report contains 4,915 country years of data compiled by Johnston and Jacobson over the last 32 and 14 years, respectively. Below are the full introductory remarks by CLI’s Chuck Donovan. To view the entire webcast on the report, click here. To view Mr. Donovan’s remarks in PDF format, click here. Well, I have a very difficult task this morning. It’s to kick off a report about 1.018 billion abortions worldwide over the last century. I want to thank Family Research Council, Tony Perkins and Arina [Grossu] for hosting this tremendous gathering on a mammoth work of history, statistics, and hopefully of understanding. I’ve read, looking through the individual data and the way you might analyze it and try to come to grips with it, you immediately notice that 739 million of these human lives were lost in Communist countries. Just four blocks away from where we are is the Victims of Communism Memorial. If you haven’t been there, it’s worth your trip; it’s an emotional place to pass by. There is a statue, a sculpture of the “Goddess of Democracy,” who was erected in Tiananmen Square by brave Chinese students who in unnumbered numbers lost their lives, standing up for democracy and freedom, and I trust probably for life as well. Well, it says on the base of that statue that it’s a memorial to the 100 million victims of Communist persecution. After this report, there ought to be a multiplier, and an amendment somewhere on that site. Having said that, we in the United States and the rest of the free world as we understand it, do not escape without a great black mark in this report. Even more so because we are free. CLI President Chuck Donovan presents at Family Research Council on January 25, 2017. We did a study – Family Research Council probably inspired it – but at Charlotte Lozier Institute, with respect to elective abortions late in pregnancy. There are seven nations worldwide that allow elective abortion after 20 weeks. Now life begins at conception and is worthy of protection from that point on, but the truth is that we are in the company of North Korea, China and four other nations. We did it by judicial decree. They did it by other means of decree. So we escape no black marks in this report. We also know that statistics like those in this report are impossible to grasp, simply impossible. [There is] the famous quotation from Stalin when he was Commissar of Munitions, and he was discussing with the Commissar responsible for Ukraine, where a deliberate famine had killed millions, and he was reciting the statistics to Stalin, and Stalin replied, “Well, if only one man dies of hunger, that is a tragedy. If millions die, that’s only statistics.” How do we get around the fact that we are dealing with what for many will seem like only statistics? Well, it’s very hard to put it in any frame of reference that penetrates our minds and hearts, but it would be the equivalent of 1 in 6 people. One in 6 people in our world today who are not here, who are lacunae in our friendships, in our loves, our families, in our territories and our homes. So how do we look at it? Well, there’d be one more person who should be here on this panel speaking today. If you’re in the Metro system, it would be that last car that doesn’t come in, or the empty car. Or maybe, for those of us who wait on Metro delays, it would be the driver who didn’t report to work, creating the delay. If you’re a fantasy football leaguer, the top 30 rushers you might choose from, well, five of them are not there because those five people were obliterated in the United States in the womb in recent years. If you worked at the patent office, there would be 65,000 patents not granted in 2015. What might those patents have done to improve our lives? It would be the millions worldwide who cannot find a spouse, almost always a wife because of the incredible policies of destroying unborn women. It would be nine missing members of our current astronaut corps, who will not be finding new worlds for us, and new ways of living in the one we have. This is just one way, and I’m sure many others will come up with a way, to cope with statistics that overwhelm the human mind and heart. But we cannot be overwhelmed. Certainly, Thomas Jacobson, here today, and William Johnston, a person I’ve longed to meet for many years after using his Johnston Archives (incredible labor, 5,000 data years – it scares me to think about it) – they were not overwhelmed. And here we are in a public place today where you get an hour or so to explain it, but I know how much labor there was. It’s kind of like a medieval manuscript illustrator, all of that for one book. This is where we are, all of this for one report, but it’s a report the world needs to hear, to heed, to take to heart, to make sure that our memorials to the lost are complete and tell the full story, and that we use these efforts to fill that story out, and that we don’t have the “empty chairs at empty tables” that have become the modern world. 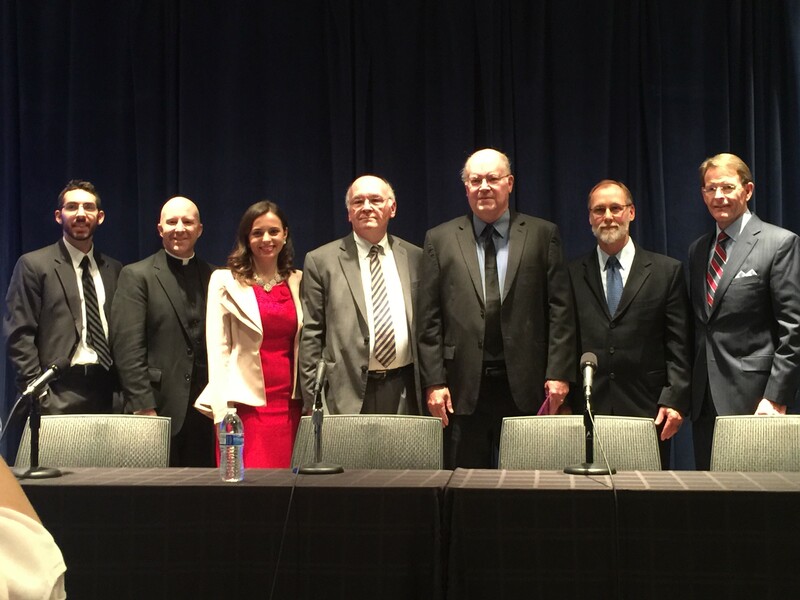 Chuck Donovan with other presenters at Family Research Council on January 25, 2017. * Remarks adapted slightly for clarity.